AntiDupl.net is a free program for the Microsoft Windows operating system that assists you in detecting and dealing with duplicate images. If you store images on your computer, chance is that you eventually encounter duplicate images. This can be because some have been downloaded from multiple locations, in batch where it was not enough time to check the pictures before downloading them, or because of copying and moving them around on the computer system. Maybe you used different programs to sync them with the computer, or different cloud storage services. While you may be able to check a couple images for duplicates, it quickly becomes too time consuming to do so for hundreds or even more. The only option then is to use a software that detects duplicate images automatically. And AntiDupl.net is that kind of software. The software is comparable to other applications that can detect duplicate images like Duplicate File Finder, Visipics or Softchronizer. It works by selecting files or folders that should be processed to detect duplicates. 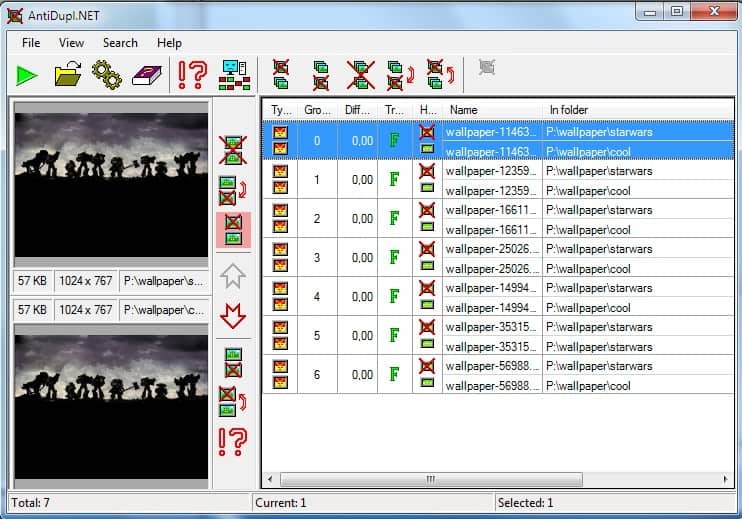 The program compares the content of the images loaded into the interface to detect duplicates. The results displays pairs of duplicate images with information that include the file name, local path and a difference value. The difference value tells you if the images are identical, or if they are nearly identical. Automatic options to delete duplicate images are offered although those are limited to deleting the first or second image of a pair without options to define other parameters like deleting images based on size, file type or screen resolution. The scan of all images is on the other hand very fast and it is possible to delete images manually in the results window. You may want to check out the options of the program on first start. There you find a few dozen preferences to change various program features. You may change the threshold difference for instance which defines how different images may be to be considered duplicates. Other options include ignoring too small or too large images, selecting supported image formats that the program will check for, or changing the algorithm that the program uses to compare images. AntiDupl.net is a free software program that can detect duplicate images. It supports the graphics formats jpg, gif, tiff, bmp and png. The program supports all major 32-bit and 64-bit Microsoft operating systems and requires the Microsoft .net Framework 2.0. The program is easy to use but powerful. One of its main features is that it does not only detect duplicates by file name or size on the hard drive, but also by content.